We’d love your help. Let us know what’s wrong with this preview of Light and Shadow by Mark Colvin. Mark Colvin is a broadcasting legend. He is the voice of ABC Radio's leading current affairs program PM; he was a founding broadcaster for the groundbreaking youth station Double J; he initiated The World Today program; and he's one of the most popular and influential journalists in the twittersphere. Mark has been covering local and global events for more than four decades Mark Colvin is a broadcasting legend. He is the voice of ABC Radio's leading current affairs program PM; he was a founding broadcaster for the groundbreaking youth station Double J; he initiated The World Today program; and he's one of the most popular and influential journalists in the twittersphere. Mark has been covering local and global events for more than four decades. He has reported on wars, royal weddings and everything in between. In the midst of all this he discovered that his father was an MI6 spy. Light and Shadow is the incredible story of a father waging a secret war against communism during the Cold War, while his son comes of age as a journalist during the tumultuous Whitlam and Fraser years and embarks on the risky career of a foreign correspondent. Mark was witness to some of the most world-changing events, including the Iranian hostage crisis, the buildup to the first Gulf War in Iraq and the direct aftermath of the shocking genocide in Rwanda. But when he contracted a life-threatening illness while working in the field, his life changed forever. To ask other readers questions about Light and Shadow, please sign up. With all the spies in the news, this is a timely update by a spy's son (and so much more). UPDATE March 2018. Melbourne University Press has issued an updated edition (with a new cover) and a wonderful piece at the end "In Memory of Mark Colvin" by his great friend and colleague, Tony Jones. Tony tells of Mark's broadcast that inspired him to set his sights above the local newspaper and get into foreign correspondence work. Tony shares a bit of their long history together and his own insights into the man so many Aussies loved to listen to. He sat with Mark during his last days, and this is a fitting tribute to his irreplaceable friend. If you have a Kindle of e-book copy, you should get the update automatically. 5★ - Straight to the favourites shelf! I’m not going to attempt to discuss his life and extraordinary friends and relatives, other than to say many of us would be happy to name-drop, as he does “my mother’s great-aunt Ethel and her husband, the former Australian prime minister Stanley Bruce. ‘Uncle S. . . ’” THAT sort of name. But ‘Uncle S’ is hardly a far-fetched claim-to-fame that some might think. He stood in for Mark’s grandfather (Bruce and his wife had no children), took Mark’s mum around Europe and gave her away at the altar. THAT kind of relationship. Colvin grew up with telephones, tape recorders and, sometimes, diplomatic bags. When he was amongst the first on the scene at the 1977 Granville train disaster (a horrific bridge collapse onto a passenger train in Sydney), there were no public phones free in the area. He could easily have fallen to pieces during his hair-raising travels around the world, including Mongolia, countless war zones, and Russia. His stories are even more special because he’s such an intelligent, well-read man who knows and appreciates the history and the culture of where he goes. He’s also a knowledgeable music lover, so music features often. Of course it’s the spy stories that have probably piqued the public's curiosity the most. Born in 1952, Mark grew up during the Cold War era, so like many Western children, he was made aware of the threat of Russian spies. Of course, what he tells us now has been learned or gleaned later from research or after his father opened up a bit when things became declassified or when he trusted Mark’s discretion. Mark certainly hasn’t been indiscreet, but the stories are terrific! This is from 1955 when Kim Philby, the famous double agent was technically “cleared” (although everyone knew he was guilty). But he had very strong defenders still in the service who said Philby simply couldn’t be guilty because he’s “one of us”. I enjoyed this entertaining bit about the questioning of one of Philby’s closest friends (presumably by another equally friendly interrogator). ‘Security Officer: Sit down, I’d like to have a frank talk with you. Nicholas Elliott: As you wish, Colonel. Officer: Does your wife know what you do? Officer: How did that come about? Elliott: She was my secretary for two years and I think the penny must have dropped. Officer: Quite so. What about your mother? Elliott: She thinks I’m in something called SIS, which she believes stands for the Secret Intelligence Service. Officer: Good God! How did she come to know that? Elliott: A member of the War Cabinet told her at a cocktail party. Elliott: I’d prefer not to say. Officer: Then what about your father? Elliott: He thinks I’m a spy. Officer: So why should he think you’re a spy? “Espionage is a form of licensed villainy: burglary, blackmail and bribery are tools of the trade, and with a few exceptions almost everybody is greedy for money. He’s had enough involvement covering historic events and politics to fill another book, and then there’s the changes to journalism, radio, and television during his time working on papers, ABC’s iconoclastic 2JJ (Double J), and Four Corners. There seems little of any importance in this area he hasn’t been a part of, and uppermost has been fact-checking right up to the last moment before broadcast! No longer able to gallivant about the globe, Mark Colvin’s voice and Twitter feed are well-known to Aussies, and thank goodness for that. He reckons he’s pretty good at triangulating stories to check veracity. I was taught to find three sources for information, and they must not reference each other. Colvin is a reliable source. Thanks to NetGalley and Melbourne University Press for the copy for review from which I’ve quoted. Thanks especially to Mark Colvin for writing this. So vivid - whether it's London, Canberra or Outer Mongolia. An enthralling memoir for anyone interested in global politics, being a reporter in places like Iran, the world of spying or just the back story of that great radio voice. So much of interest in this book that I think I will read it again to take in all the facts. But I thought that was part of its problem, it was too dense in information to really enjoy. 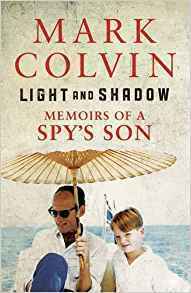 I liked the second half of the book more when the story turned to Mark Colvin's career than that of his childhood and his father's role as a spy. But I was left wanting to know more about his later years, which aren't really covered. I feel a sequel coming on! Mark Colvin has a great voice and makes the entire book very entertaining and enjoyable to read and at the same time manages to make you feel as if everything he talks about is something that is happening -kind of like watching a movie! which is something not many authors manage to do! So kudos to Colvin for really bringing a lively story into book format! i really enjoyed the views into his journalistic history and learning more on how he became a journalist and how that career evolved. I loved getting to know big world events from his point of view, how he remembered things happening and even how in many big historical moments that was covered hugely by media, he actually was a part of and there to witness it as the journalist reporting! All that? That was great in this book! What i honestly did not really get and found a bit.... strange is not the best word for it but it is the best i can do -i am not as articulate a writer as Colvin is!- where his family moments and when he talks about his father. For me those moments -the moments that clearly where supposed to be a big and important part of the book since the subtitle is "Memoirs of a Spy's son"- felt very interrupting and choppy and a bit unfinished overall. I don't know if it felt that way to me because i really enjoyed the other parts of the book more -his story of how he grew up and the career parts i already talked about- interesting and the mentioned and pointers that his father was a spy where just kind of moments to me that i just wanted to get through to get back to the interesting things of the book. Especially since Colvin never really talked about what his father did, how he did it and where he did it. There were small mentioned, and Colvin tells the story how he really found out his father was a spy and that was fine, but all the moments where he kind of starts to get a bit more into his father and the life he had and then he just stops and points to the books his father wrote with the mention of how the government made sure that his father didn't talk about things they didn't want the public to know. So after those moments everything kind of stopped and we didn't know anything new, and in a way it felt to me like where were walked directly in front of a wall without any real purpose of being there or that Colvin knows how he got there and he needed a few pages to actually get back into the story. To wrap this all up, i really enjoyed the nicely done mixture of politics, history, journalism both in personal view and overall history as well as his personal childhood memories but i think that he should have just focused on that and not try and build in his fathers life and career into the book as well. Brilliant autobiography of a highly respected Australian journalist, with insight into why he was so good at what he did. His account of his English prep school was sad but honest, and his insight into so many parts of the world is amazing. I heard it on an audiobook, with Mark himself reading. I recommend hearing it this way. Mark died recently, of complications of an illness contracted in his travels as a foreign correspondent. He will be missed. I loved this book wholeheartedly. Such an in depth history, from Mark's first memories at the age of 2. It was a wonderful insight into machinations around the world. I could feel it filling in the missing jigsaw pieces for me, for example in Australia politics and the Cold War. I enjoyed this book immensely. Mark Colvin writes a wonderful memoir of his parents and his journalistic adventures. I found it exceedingly interesting. I didn’t know anything about Mark Colvin before reading this book, but thoroughly enjoyed finding out about his life as a broadcaster. He talks of a happy childhood, living in several countries. He remembers staying in his grandmother’s house in England one winter. His grandfather had been a Navy man and the house was decorated with portraits of Nelson and there was a display case full of medals. His grandmother sounds like a big character, very well-spoken and old-school. His father was largely I didn’t know anything about Mark Colvin before reading this book, but thoroughly enjoyed finding out about his life as a broadcaster. He talks of a happy childhood, living in several countries. He remembers staying in his grandmother’s house in England one winter. His grandfather had been a Navy man and the house was decorated with portraits of Nelson and there was a display case full of medals. His grandmother sounds like a big character, very well-spoken and old-school. His father was largely absent from Mark’s early years but he talks of living with his mother in various places. In London he went to see the Guinness clock in Battersea Park, which I’ve heard about many times now in various histories of that period. There’s a wonderful account of life in Malaya (as it was called at the time). He remembers learning to read and mentions many of the childhood books he enjoyed, including The Secret Garden. At about the age of seven he went to boarding school, which was a difficult experience. I hear so many awful stories about English boarding schools that it’s astounding that they survived. And many fathers sent their children to the same school they went to themselves! Why would you do that to your own child? Yes, I know that it allowed ‘the right people’ to get to know each other, and it led to the ‘right’ jobs, relationships and opportunities, but did it have to be so brutal to achieve that? Mark was no good at sports, partly because he broke his arm in a riding accident and it never healed properly, and this was another disadvantage is a school system that prided physical and sporting prowess. So he had a tough time. Beatings, bullying and abuse were just standard, accepted by everyone, even his own parents. He talks movingly of how this experience led to him being unable to trust people. But he turns this in a positive direction by saying it made him the journalist he was, never accepting what those in authority said and not trusting what lay on the surface of a story, but digging deeper to find the truth. He also mentions how many people in recent years have come forward to talk about their appalling experiences and this brought to my mind all the MeToo and TimesUp revelations that are ongoing at the moment. But over time he learned how to lock his anger and suffering away and how to become, or at least to seem, a good student. I found this part of the book heart-breaking. Interestingly he made friends with a boy called Casper Fleming at that school. Apparently he was a great story teller. His father was Ian Fleming, author of the Bond books. Neither of the boys knew at the time that both their fathers were spies! It doesn’t seem surprising that his parents split up during this time. His father was hardly ever at home and his mother lived an independent life. It was relatively amicable though and he saw more of his father in the few years after this than before. He doesn’t talk as much about his father as I would have expected, given that the subtitle is ‘Memoirs of a Spy’s son’ but I enjoyed those snippets, and also those of his other family members - it was an illustrious family! He talks of his developing career as a broadcaster, including time spent at a station called Double J where he had to run up ‘Cardiac Hill’ several times a day from one building to another. He tells of a time when he was watching a forest fire and saw the air around some trees (not the trees themselves) burst into flames because of the eucalyptus oil in the air. It is little anecdotes like this that bring the book to life, but he also talks of major international conflicts and wars and of Australian politics. I enjoyed the latter even though I didn’t know much about the political issues or people he referred to. As he has been reporting for decades, he includes some interesting information about how the life of a journalist has changed during that time. In the early days, before the celebrity culture, he could more easily get through to politicians or senior business executives without being diverted or blocked by PR reps. Also people, whether politicians, sports personalities or the public, were less familiar with being approached by someone with a camera or microphone. They had to be cajoled into giving a few words on air and were often monosyllabic in their responses. My own reaction to that is that perhaps it was better back then, compared to today's media-trained spokespeople who trot out the same platitudes over and over, and never seem to be really themselves. How many times have I heard ‘our thoughts are with the family at this time’ which they have clearly got out of a text book, rather than speaking naturally from their own hearts. They are so afraid of protecting their media image that they have allowed themselves to be moulded and shaped into carbon copies of ‘the perfect spokesperson’. The research tools and information available to him were also vastly different. If he wanted to do some background research on someone he had options such as ‘Who’s Who’, an encyclopaedia or the phone book. He took a notebook and pencil with him and knew shorthand. He had to get all the details right at the time, including spellings, as he couldn’t check them on the internet later. A journalists’s contact book was his most precious resource and guarded carefully - it included the direct-dial or home numbers of key contacts because, again, these were so much harder to find back then. In the early days he had a sound recorder that was so tough that it survived being run over by a tank (although was well known as back-breaking to carry). I used to listen to Mark Colvin every weekday afternoon as he presented the ABC Radio PM Current Affairs program for twenty years. I respected him as a journalist who was determined to bring listeners the facts and who kept away from expressing his own opinion. What a diverse range of experiences Mark had, he seemed perpetually interested & clearly a fascinating man. I enjoyed the history tour & world events interpreted through his lens. I admire his voracious love of 'telling the story' & the last two words of the memoir made me smile, curious to the very end of his days. A great read. An eloquent, intelligent description of a marvellous life set in a well explained context. If you are interested in the media, Australian or world politics, espionage or the Cold War, this is a must read. One of those books that makes you want to read more. major world events and political change set the scene for this compelling and well written memoir. I enjoyed the book, but would have liked more about the man himself and less about the historical events. Dates and names gloss over me! I clearly remember an early 1980s report by Mark Colvin on 2JJ from the streets of Kabul and him describing the stench of human death and how it adheres to your nasal passages. It was an example of the quality journalism that this man practised his whole life. Reading Light and Shadow was like holding up a mirror to my life. Colvin was six months younger than me. He lived and experienced so many of the events that have made up the story of the last half century. I particularly identify with his t I clearly remember an early 1980s report by Mark Colvin on 2JJ from the streets of Kabul and him describing the stench of human death and how it adheres to your nasal passages. It was an example of the quality journalism that this man practised his whole life. Reading Light and Shadow was like holding up a mirror to my life. Colvin was six months younger than me. He lived and experienced so many of the events that have made up the story of the last half century. I particularly identify with his taste and love of music, his observations of the social changes and the role that the ABC has in Australian life. His voice brought comfort and certainty to my ears. Vale one of Australia’s finest journalists. This book is a dual memoir of his life and many parts of his father’s life as a British spy. It is interesting that the way he structured this memoir. Much of it is taken up with accounts of his father in his placement at various British consulates around the world, Malaysia, Austria, Mongolia, and finally Washington. Colvin has a, at times broken and distant relationship with his father, but as he has centred so much of this memoir around him, it was undoubtedly a deep and meaningful relationship. Colvin was born in the UK with an English father and an Australian mother. His parents split and she returned to Australia. Although educated at Oxford Colvin first started work with the ABC. He mentions many notable names of ABC identities from the 70s, 80s and 90s. In his early days he worked on the newly formed 2JJ. I remember I was driving to the beach on a Saturday in January 1975 and I had my car radio set to pick up JJ when it started broadcasting at 11am. JJ was such an important part of my life during this time and as Colvin writes it exposed its audience to music that they would have never heard on commercial radio. Colvin went onto work with many of the stalwart ABC programs, concluding his career with a long stint as AM presenter. In his time as journalist he covered numerous major news events, Hilton Hotel bombing, Granville train disaster. I think he was at his best as a foreign correspondent. His early chapter on his time in Iran in 1979 is special. His comment that the failure of the Carter administrations dealing with the Ayatollah Khomeini regime and the disastrous rescue attempt led to the election of Reagan and the introduction of Reaganism and its infiltration into the Wests political and economic thought. Colvin mentions the fracas over the 1976 appointment of Henry Bland as Chair of the ABC and his perceived role of being Fraser's hatchet man. Recent ABC sackings show history repeating itself. The charge that ABC journalists are all “lefties” falls flat with Colvin. His family background and certain comments about the Labor Party and trade unions are a demonstration that he was his own man and definitely not a stoolie of the Left. Colvin contracted a serious disease in the 1990s in Africa. It plagued and punished him for the last twenty-three years of his life. Nevertheless, he did not want this disease to define him. Mark Colvin's memoir provides a fascinating insight into the world of radio journalism, and later, as a foreign correspondent. This is particularly so as Mark was reporting from foreign shores well before the role of a foreign correspondent was popularised, and the advent of television programs such as Foreign Correspondent and the like. This was a time of limited digital technology which has revolutionised journalism and the media. Mark's intellect and knowledge of world affairs is stunning. His Mark Colvin's memoir provides a fascinating insight into the world of radio journalism, and later, as a foreign correspondent. This is particularly so as Mark was reporting from foreign shores well before the role of a foreign correspondent was popularised, and the advent of television programs such as Foreign Correspondent and the like. This was a time of limited digital technology which has revolutionised journalism and the media. Mark's intellect and knowledge of world affairs is stunning. His commitment to reporting the truth holds him in very high esteem among many other great journalists across the globe. Sadly, journalism is not always held in such high esteem by the general public, as many journalists and media bosses seem willing to distort the truth. Mark Colvin has lived a life that many of us can only read about or dream of. No doubt it was full of normal human frustrations, sadness and every day 'humdrum', as well as the happiness, excitement and adventure that life can provide; no different to the rest of us, but Mark shows that life is what we make of it. This is quite evident at the end of the book, when he uses twitter to assist him gather and filter information from across the globe to report on world affairs, when physical illness confined him to the radio studio. Sadly, we lost this great journalist in May 2017. At the time he was the voice of PM on ABC Radio. That wonderful voice that exuded trust and confidence in the information being presented. RIP. A wonderful book. You can hear Colvin's distinctive voice throughout. Melds stories of his journalistic career with his relationship with his father & father's career as a Cold War MI6 spy. Plus: we had sim A wonderful book. You can hear Colvin's distinctive voice throughout. Melds stories of his journalistic career with his relationship with his father & father's career as a Cold War MI6 spy. I miss Mark Colvin's precise voice and insightful journalism: he was the epitome of professional ABC journalism and stood out like a giant above the self-indulgent crap that poses as journalism in much of Australian commercial media. What a well-written memoir and how sad that such a pioneer is now silent. An incredibly interesting read of world affairs from one inquisitive mind. Both Mark's and his father's careers provide a really engaging view of world politics in our life time. I'm not sure where to start with this book. It is such a rich, detailed, fascinating, entertaining and sad book that it is hard to sum up in a review. I'm struggling to put my impressions into words. Perhaps I'll start with something that Mark Colvin mentions at the end of the book - gratitude to Louise Adler, his publisher, for encouraging him to write his memoir. What a loss to the world it would have been if he hadn't put his life experience into words for us. What an amazing life he led. Wha I'm not sure where to start with this book. It is such a rich, detailed, fascinating, entertaining and sad book that it is hard to sum up in a review. I'm struggling to put my impressions into words. Perhaps I'll start with something that Mark Colvin mentions at the end of the book - gratitude to Louise Adler, his publisher, for encouraging him to write his memoir. What a loss to the world it would have been if he hadn't put his life experience into words for us. What an amazing life he led. What a funny, interesting, and intelligent man and sad, too, that his life was cut short by illness and disability. He died age 65, less than a year after the book was published. Given life expectancy is currently in the 80s for men of his socio-economic place in history, we lost a good 20 years of Mark Colvin. However, his final post to Twitter sums it up best "It's all been bloody marvellous". It was a joy to listen to him read his own memoir. His voice is wonderfully rich, deep, warm and capable of making me laugh out loud when he makes his little wry or biting observations about the absurdity of life and stupidity of some human behaviour. Listening to him tell the stories of his life gave me the odd sensation that I was sitting in his home, at his dinner table, while he reflected on how family, history and his career had shaped the events of his life. It was strangely welcoming as I was invited into his life and yet he clearly aimed to keep it from being intimate or personal. Though, having said that, the part of his life story that reflected on some deep emotions - ones of hurt, confusion, and destruction - were his years in English boarding school. He provides detailed and disturbing accounts of the physical, emotional and psychological brutality he was exposed to, and he reflects on the personal and wider systemic effect of this horrific legacy. He references the impact these years had on his ability to trust others, and he also comments on the thousands of stories that came forward in England during a recent journalistic expose, in 2014, of brutality in English boarding schools. He stresses that whole generations of English people were harmed and that this trauma is passed on with intergenerational effects. I listened to this part of his story with a heavy heart. Mostly though, the memoir rolicks along through adventure after adventure - personal, family and journalistic adventures. As I was listening, I kept thinking, 'wow - he was there at that major event, and that one too, oh and that one'. I think partly my joy in reading this memoir is because he was only about 10 years older than me. So much of what he experienced in terms of historical events, I also experienced - though he wore it better, of course. He added insight, personal reflection and journalistic analysis to all these events - The dismissal of Whitlam, the Granville train disaster, the hostage crisis in Iran, Russia and Gorbachev in the 1980s, the meltdown at Chernobyl, Trimboli's death in Europe, Rwanda in 1994, and September 11 in 2001. The other great theme of the book is of course his development as a journalist from pretty much falling into the occupation when he was at a bit of a loose end, unemployed in Canberra in the early 1970s, through to his eventual mastery of the social media platform, Twitter. While it does cover, with humility and modesty, his development of the social, intellectual and behavioural skills of a journalist his memoir is peppered with constant reflections on technology. He often stops and lets the reader know all the details of the craft and technology of journalism - the recording devices, the essential paper and pen note taking through Pitman's shorthand, the knocking on doors to ask people if he could use their telephones to call in a story (pre-mobile phone times you young ones), his frustrations at the backwardness of the technology in Old Parliament House, the journalists contacts list (in the days pre-internet fact checking this was critical), the respect offered to people by having coffee or offering social time to them before you grab the facts (Colvin's Trimboli scoop is a great story), through to his final love affair with the power of Twitter as a research tool and a direct connection into the events of our time. This is a wonderful memoir by one of Australia’s most loved broadcasters. Mark Colvin was a legend of Australian radio and, in his prime, television, having spent his entire career working at Auntie, Australia’s national broadcaster, the Australian Broadcasting Commission (ABC). After covering conflict in some of the most remote and dangerous places in the world, he was struck by a number of chronic illnesses and spent the last two decades of his life in and out of hospital from where he continu This is a wonderful memoir by one of Australia’s most loved broadcasters. Mark Colvin was a legend of Australian radio and, in his prime, television, having spent his entire career working at Auntie, Australia’s national broadcaster, the Australian Broadcasting Commission (ABC). After covering conflict in some of the most remote and dangerous places in the world, he was struck by a number of chronic illnesses and spent the last two decades of his life in and out of hospital from where he continued to work, becoming the voice of the ABC’s PM program, which is where I primarily knew him from. With the most wonderfully cultured and trust-filled voice, Mark brought us the best kind of current affairs: balanced, thoughtful and based on fact. He also brought warmth and humour to Auntie, despite attacks on the ABC by a wide range of critics. In Mark’s brilliant book he takes us through all of these challenges without hyperbole and with his characteristic sharp eye and entertaining view of the world, all the while rooted in and conscious of its history. Like many, I had no idea Mark’s father was an MI6 spy—Mark does a wonderful job of exploring how his gradual understanding of who his father was helped explain how Mark became one of the best minds of our time. He died in 2016, working almost to the end. The book was updated following Mark’s death, with an afterword by Tony Jones, another legend at the ABC. He describes Mark as a national laureate and its a moniker that fits. I miss Mark’s insights terribly and often wonder what he would make of the twists, turns and spills of our current geopolitical state. He would have been able to help make us understand what on earth is going on and why. Mark Colvin died on 11 May 2017, days after I finished reading this book. The outpouring of grief and memories from journalist colleagues that worked with him, political figures that admired and appreciated his integrity and rigour amongst a culture of superficiality, and his audience both through the media and via his Twitter feed was both genuine and a testament to the outsized impact he had as a broadcast legend. It is to our lasting benefit that we have his memoir, which tells not only of bo Mark Colvin died on 11 May 2017, days after I finished reading this book. The outpouring of grief and memories from journalist colleagues that worked with him, political figures that admired and appreciated his integrity and rigour amongst a culture of superficiality, and his audience both through the media and via his Twitter feed was both genuine and a testament to the outsized impact he had as a broadcast legend. It is to our lasting benefit that we have his memoir, which tells not only of both his professional life but also of his father, who Mark discovered later in life was a MI6 spy. This was an engrossing read. The separate stories of Mark’s professional career and of his father’s life and role as an MI6 spy would be enough to be a worthwhile read, and the combination of the two and the complexity of their interaction adds another dimension to his life. Travelling through both his and his father’s life is to be involved in the events of history – the Cold War, China before it opened up, the founding of Double J, and more. One can hear the words written in Mark’s distinct voice, precisely chosen words, intellectual curious of the world, yet sceptical of any uncritically evaluated evidence and being equally conscious of the limits of himself. Even if you don't know the name, you will remember the mellifluous soothing voice of the late Mark Colvin - ABC foreign correspondent for decades, including presenter on Four Corners, Lateline and many more. A legend of good old fashioned journalism at its best. He sadly passed away far too early in 2017. His autobiography - 'Lights ad Shadow: Memoirs of a Spy's Son' is a terrific read. From covering the American hostage crisis in Tehran in 1979 to the Rwanda genocides in 1992, Colvin reported fi Even if you don't know the name, you will remember the mellifluous soothing voice of the late Mark Colvin - ABC foreign correspondent for decades, including presenter on Four Corners, Lateline and many more. A legend of good old fashioned journalism at its best. He sadly passed away far too early in 2017. His autobiography - 'Lights ad Shadow: Memoirs of a Spy's Son' is a terrific read. From covering the American hostage crisis in Tehran in 1979 to the Rwanda genocides in 1992, Colvin reported first hand from some of the most pivotal moments of recent history. His anecdotes about those early days of his illustrious career are fascinating insights into how much technology has changed journalism and how the media works. Like many other autobiographies by media people it is a bit light on personal insights, except for the at times fractured but enduring and ultimately loving relationship with his father, who was a spy for British Intelligence, but without Mark and his sister knowing until well after their dad was retired. It adds an extra dimension of intrigue to some of the dramatic world events that Colvin witnessed. The author Mark Colvin was an ABC journalist and radio presenter for many decades. This amazing series of recollections, memories, news stories, and family connections is worthy of many re-reads. It is a dichotomy between professional excellence and personal insecurity. This book represents the author's outstanding linguistic ability plus his intense need to tell many exciting exotic tales while revealing as little as he can about himself in the process. He is the master of understatement often s The author Mark Colvin was an ABC journalist and radio presenter for many decades. This amazing series of recollections, memories, news stories, and family connections is worthy of many re-reads. It is a dichotomy between professional excellence and personal insecurity. This book represents the author's outstanding linguistic ability plus his intense need to tell many exciting exotic tales while revealing as little as he can about himself in the process. He is the master of understatement often shrouding massive achievements as being almost accidental and his own contributions as minimal. Here is a book which could nearly qualify as a compact modern day world history and this man Mark Colvin was actually there on the spot to record events as they unfolded in front of his eyes. His father, the spy in MI6 was employed to uncover enemy secrets for use by the British Government while divulging nothing of his real intent to his family or anyone else. Mark on the other hand was employed to uncover news and espionage with the express intent of spreading that news to as many listeners as possible. Mark was inducted to the Media Hall of Fame in 2018. This is a brilliant book which really deserved the sequel that was planned to follow. Sadly the author died in 2017 before a second book was written. One of the most treasured books in my possession, thanks in no small part to Aptronym whose generosity as always came to the fore when she gifted an inscribed tome to me as well as to Bob, obtained when she attended the book launch. I was very much looking forward to the next instalment. Mark was quite chuffed at the title he had come up with, “Seven Circles” in which he was going to write about Murdoch, the veracity and influence of media, and his illness. The reference of course being to Dante’ One of the most treasured books in my possession, thanks in no small part to Aptronym whose generosity as always came to the fore when she gifted an inscribed tome to me as well as to Bob, obtained when she attended the book launch. I was very much looking forward to the next instalment. Mark was quite chuffed at the title he had come up with, “Seven Circles” in which he was going to write about Murdoch, the veracity and influence of media, and his illness. The reference of course being to Dante’s “Inferno”. Knowing his prodigious intellect, he had already probably sketched out the manuscript in his mind, as he had done with chapters in this book with his near photographic memory, to be followed up with his inimitable journalistic precision and fact checking.